Vincent Hayes Gaddis (December 28, 1913 – February 26, 1997) was an American author who coined the phrase "Bermuda Triangle" in a February 1964 Argosy cover piece. He popularized many stories about anomalous phenomena in a style similar to that of Charles Fort. Gaddis was born in Ohio to Tilden H. and Alice M. (Smith) Gaddis. He married Margaret Paine Rea on July 14, 1947. Gaddis worked as a newspaper reporter and writer-editor for a Warsaw, Indiana, radio station from 1947 to 1952. He was a feature writer for the Elkhart Truth, a daily newspaper in Elkhart, Indiana, from 1952-1959. He then worked as a public relations writer for Studebaker-Packard Corporation and Mercedes Benz Sales in South Bend, Indiana. In 1962 he became a free-lance writer. He died in Eureka, California. 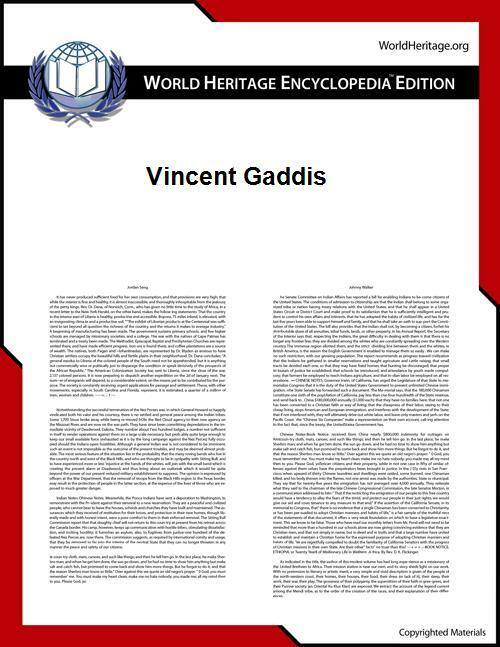 ^ Vincent H. Gaddis (February 1964). "The Deadly Bermuda Triangle". Argosy. ^ "The "Mystery" of the Bermuda Triangle". The Museum of Unnatural History. ^ Bradley, Nancy. "My Life with Paranormal Icon Vincent Gaddis". Haunted America Tours. Retrieved 8 May 2014. Contemporary Authors Online, Gale, 2007. Reproduced in Biography Resource Center. Farmington Hills, Mich., Thomson Gale. 2007.